Over the course of two years, Joey and I went to over 20 weddings. And we were probably invited to twice that many. There was one particular weekend when we were invited to 3 weddings! So now that a few years have passed, it's baby time. In our group of friends, there are 5 of us who are pregnant, so at get togethers and parties, it's become the norm to serve a fun mocktail. However, at a recent shower I helped to host, we thought it would be fun to have a cocktail-inspired cupcake. Frozen drinks are not typically my first choice, but I do love pina coladas. These cupcakes are inspired by the popular drink. I started with a coconut cake, brushed it with pineapple syrup, and topped them with pineapple Swiss meringue buttercream. Oh, this buttercream. It might be my favorite frosting I've ever made. The pineapple flavor comes through nicely without being cloyingly sweet. And using the meringue buttercream over traditional buttercream allows the pineapple to shine instead of being overpowered by confectioner's sugar. It tastes so light that some people thought it was actually a whipped cream frosting. As a few sidenotes, I added a little coconut rum to the cupcakes; if I hadn't been making them for pregnant women I would have added some to the frosting as well. I'm also giving a range for the amount of pineapple puree. I started with a cup, then just kept adding it until I was happy with the taste. Also take note that the pineapple puree needs to be made the night before, so plan accordingly. 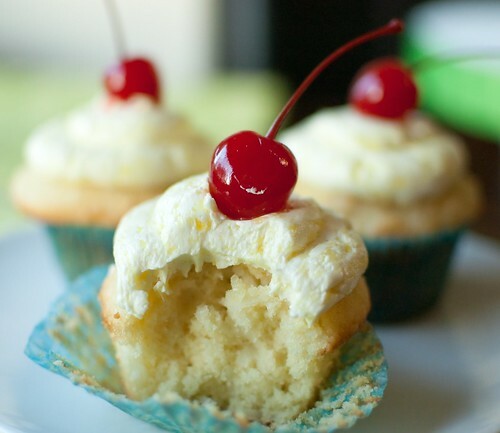 I have made these coconut cupcakes before, and while they were great for a few days after making them, this time they seemed to dry out faster. Not sure if I overbaked them a bit, the weather caused it, or what, but I just thought I'd mention that they are best within the first day or two of being baked. I know many people are scared of Swiss Meringue Buttercream, but it really is forgiving, and once you make it a few times it is pretty foolproof. Here is a great tutorial from Sweetapolita with lots of tips and tricks to make your's perfect every time! Preheat the oven to 325. Line 2 muffin pans with liners. In the bowl of an electric mixer fitted with a paddle attachment, cream the butter and sugar at medium speed until light and fluffy, about 5 minutes. Reduce the speed to low, and add the eggs, one at a time, scraping down the bowl between each addition. Add the vanilla and rum and mix until incorporated. In a separate bowl, sift together the flour, baking powder, baking soda, and salt. Alternate adding the dry ingredients and the buttermilk in three additions, starting and ending with the dry ingredients. Mix until just combined, and fold in 7 ounces of the coconut. Fill each liner 3/4 full with batter. Bake 20-25 minutes, or until the tops are brown and a toothpick comes out clean. Cool in pans for 15 minutes, then transfer to a cooling rack to cool completely before frosting. In a medium saucepan, combine the sugar and water and cook over medium heat, stirring often, until it comes to a boil. Add the pineapple, and return to a boil without stirring. Remove from heat, cover, and allow to sit overnight. Drain the syrup, reserving for the cupcakes, and puree the pineapple until smooth. With the mixer on medium-low speed, add the butter 2 tablespoons at a time, mixing well between each addition. Scrape down the sides of the bowl, increase the speed to medium, and mix until the buttercream comes together (it can take up to several minutes, but it will come together eventually). Switch to the paddle attachment and beat at medium-low speed to remove air bubbles, about 2 minutes. Gradually add the pineapple puree and rum, and mix to combine. Brush the tops of the cupcakes with the pineapple syrup. Frost as desired and garnish with additional coconut flakes and a cherry. I love the sound of the pineapple swiss meringue buttercream! 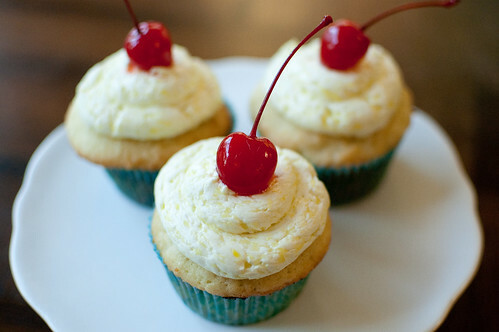 Did you find adding the pineapple puree to the swiss meringue buttercream made it too watery? RA, no, but I just added it a bit at a time until I liked the flavor and consistency. The addition of liquid doesn't really affect the swiss meringue buttercream like it does a traditional buttercream. I just discovered your blog, love it! You have some unique recipes. These Pina Coladas look wonderful, I might try them, see if I can do them justice!